So in my last hair color update in July I was a nice fire red ombre/gradient color and I LOVED it, I would have actually kept up with that color for another month or two, but at the end of September I was planning a surprise vow renewal for my husband for our 10 year anniversary and I had an end goal for my new hair color. The bouquet I picked out had bright pink and yellow roses, and the sashes on the chairs were a vibrant pink as well, so I wanted to dye my hair pink, orange, and yellow! So in my mind's eye, my hair was going to look AWESOME. Vibrant, fun, pretty. The picture below is what resulted after my first attempt. What. The. Funk. Halloween before Halloween was even here! Needless to say I was a little heartbroken and in a state of disbelief...can you believe that it took me 2 hours to get to this? I don't know what eff happened but this is not how I pictured my hair, the orange bled into the pink, the pink bled into the orange and the pink wasn't even pink, it was like a weird rusty salmon, and then there was too much yellow and the colors didn't blend and the gradient didn't work out AND...well there was a whole bunch of wrong here. First attempts for me seem to always fail horribly. SO, I decided to strip out my color the next day with the One N' Only Color Fix like last time...only this time it went horribly wrong as well, my entire head came out NEON YELLOW. Not just yellow but hints of green to make it highlighter yellow. Awful, I stripped the color twice and the yellow stayed strong. Time to cry and then bring in reinforcements. So I spent a few hours reading what the hell happened to me, and I guess when you have freshly colored hair, you should NOT try to remove the color right away. The pigments need time to settle and then you need to wash your hair a few times to help remove some of that pigment otherwise anything you do to it (i.e. color strip, bleach, etc.) could cause the pigments to be driven even deeper into your hair! Not cool. So I ended up using a vitamin C shampoo (crushed up vitamin C tablets mixed in with shampoo) treatment probably 5 or 6 times over the course of 3 days to remove the color. This of course will dry out your hair and make it even more prone to damage, but after leaving the shampoo in for 30 minutes and washing it out, I also followed by doing a 30 min deep conditioning treatment, and at the very end I did a protein treatment and an Olaplex treatment. Check out the result below. Much better! All the yellow washed out. So after stripping the color I left it the way it was. There was only 3 days left before the trip/vow renewal and I didn't want to risk messing up my hair again. Plus, I started to dig the blonde color, it was different from what I've had in the past so I wore that for about 1.5 months. 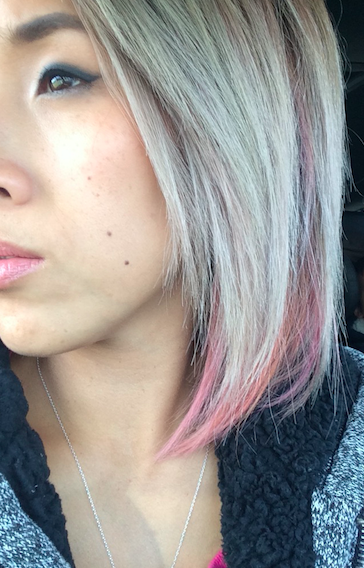 I toned it out and kept it fairly vibrant by using a purple shampoo. Fast forward to mid-October and I was getting a little bored of my blonde. I didn't really want to go crazy with full color again so I played with some peekaboo pink panels on the under layers of my hair. I gradually added more and more layers of pink, orange, and a little yellow until I ended up just doing my whole head. Pastel, kinda cute, kinda meh. I wasn't thrilled with my hair so I decided to add Pravana Magenta to sections all throughout my hair. I was FINALLY happy with the end result. I like to think I could do pastels, but with the blonde that is in my hair, the pastels just won't pop as much. Full on color is the way to go for me from now on...plus, the colors will end up fading to a pastel anyways, might as well get more wear out of each color! It's taken me so damned long to write this post to go along with the video that I might as well give you a small color update. It's been 3 washes with a sulfate-free shampoo and below is the current color. The pink washed out really quick and the colors have faded to a pretty peach/rose gold color. I've had a few compliments on it which means it musn't be all that bad :) I'm itching to start my next color already! 3 shampoos and it's faded to a pretty peach/rose gold. What do you think my next color should be?